Affiliate links are used in this post. See this page for more information. Thank you! 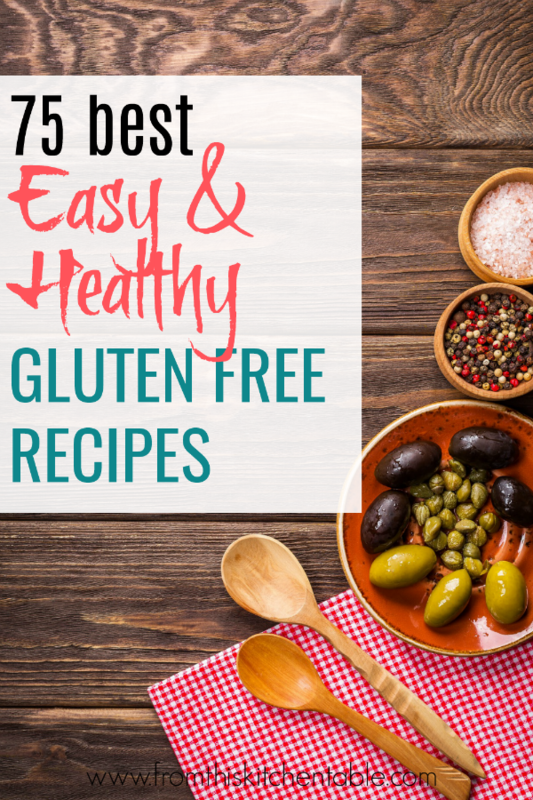 We don’t always eat gluten free (<—- click there for a great list of gluten free recipes) but we have needed to on a few occasions. These muffins are a yummy treat the kids and I both enjoy (whether or not we are gluten free 🙂 ). I don’t put much sweetener in my muffins and quick breads, but if your family is used to things pretty sweet just increase the sweetener a touch. 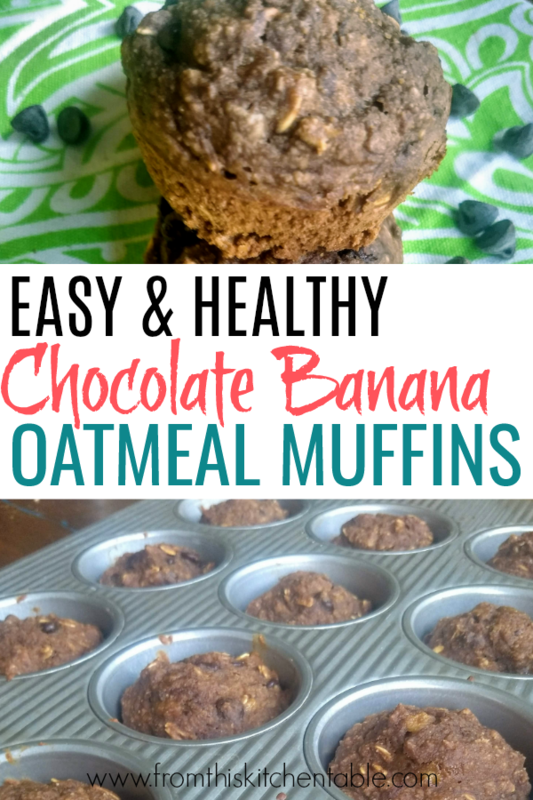 Because these chocolate banana oatmeal muffins are made with oat flour and rolled oats, the texture isn’t quite the same as traditional muffin. 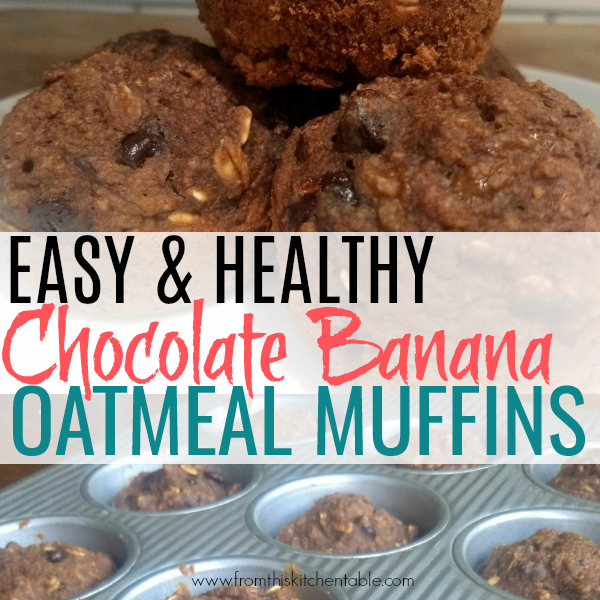 It is a cross between a muffin and baked oatmeal but they are quickly gobbled up by everyone in my house. They are great for breakfast or snack. Don’t tell my kids how healthy they are because they’ve even made an appearance for dessert. They are also perfect freezer food. Cool completely after baking and freeze in a zipped storage bag. Thaw a short time and reheat slightly before eating. Yum! I don’t like my muffins super big, (small size is slightly more kid friendly) so I make 12 regular muffins and 12 mini muffins. Use the longer baking times if you are making larger muffins. Speaking of muffins, I have to share with you my favorite muffin pan. I discovered these last year and have fallen in love. Get this, I don’t need to grease the pans and everything has come out easily. I have the standard size and the mini pan. Combine honey/sugar, milk, fat, eggs, vanilla, and bananas. 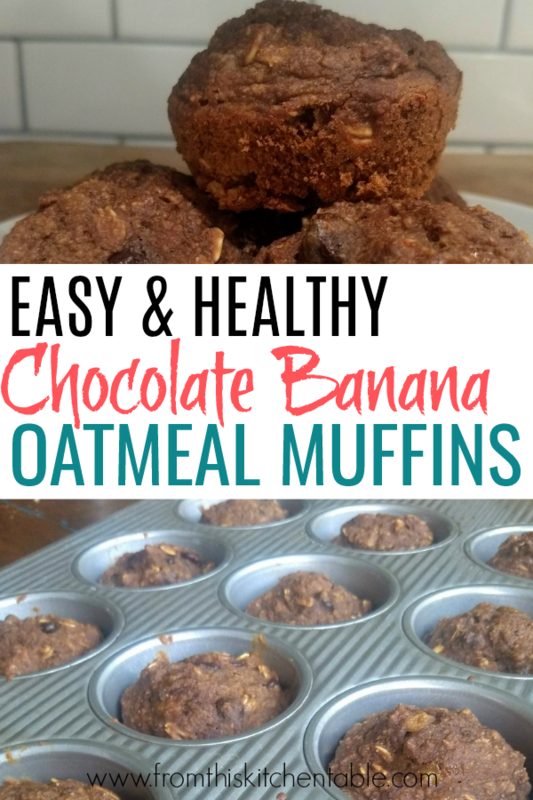 Mix in oats, baking powder, salt, and cocoa powder. Bake for 15-18 minutes for regular muffins or 10-11 minutes for mini muffins. 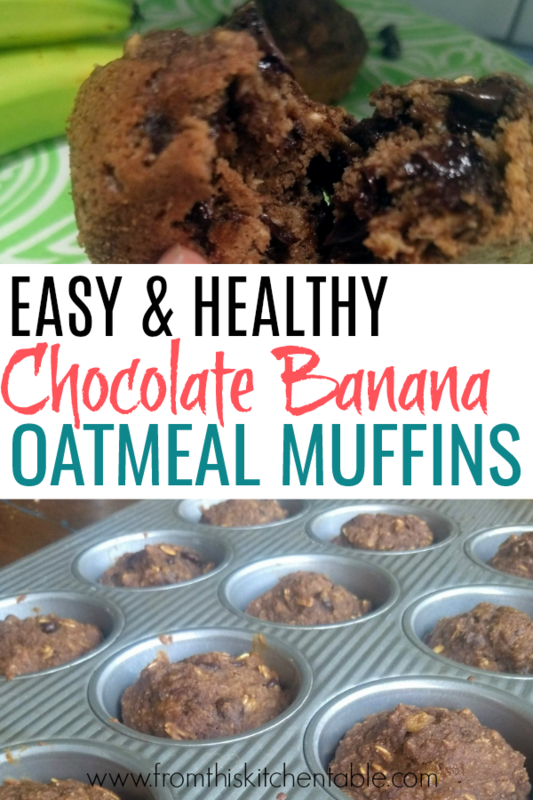 If you like this recipe, you might also be interested in these Gluten Free Oat Flour Banana Muffins that are also dairy free! 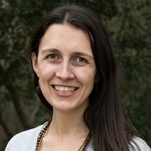 This entry was posted in Bread and Muffins, Recipes on August 23, 2018 by Deanna Michaels. 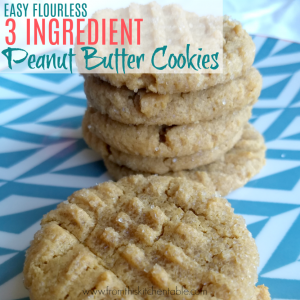 3 ingredient gluten free peanut butter cookies. Yum! In full disclosure, sometimes these 3 ingredient cookies get 5 ingredients added to them. But either way, they are made from pantry staples and whip up in a flash. 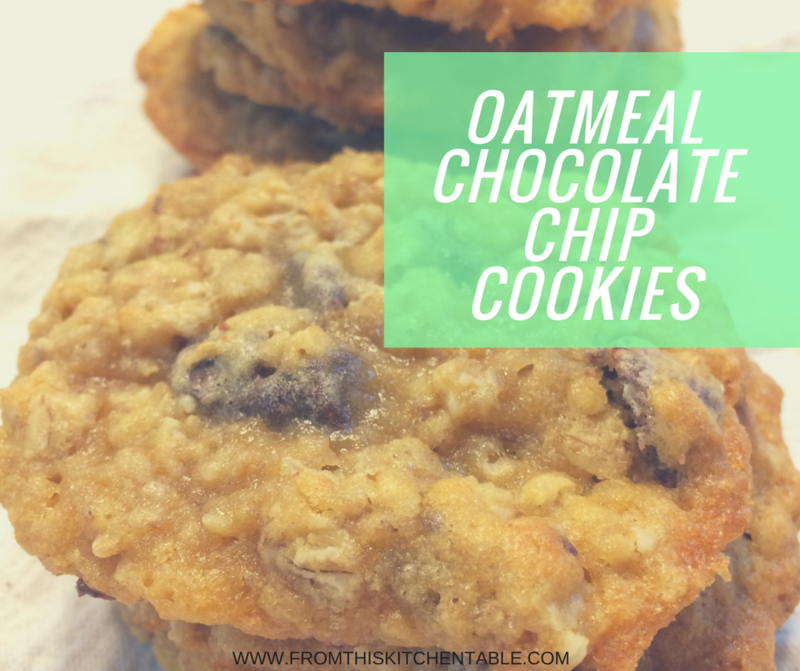 These are also a gluten free and dairy free cookie! Woohoo!!! Considering we are in the middle of 3 months without dairy or gluten for one of our children right now, this is a big deal. 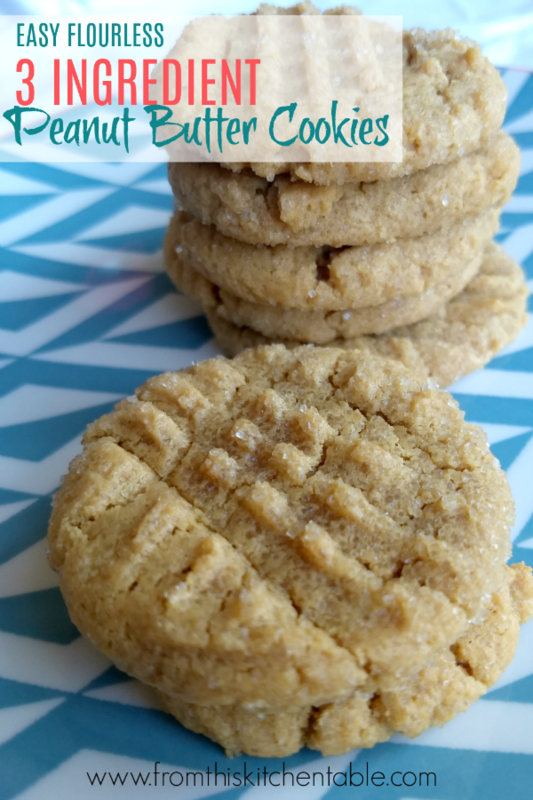 Someday soon I’d love to remake these using maple syrup or honey and 100% peanuts peanut butter, but in the meantime I needed to share this simple 3 ingredient gluten free peanut butter cookie recipe with you! 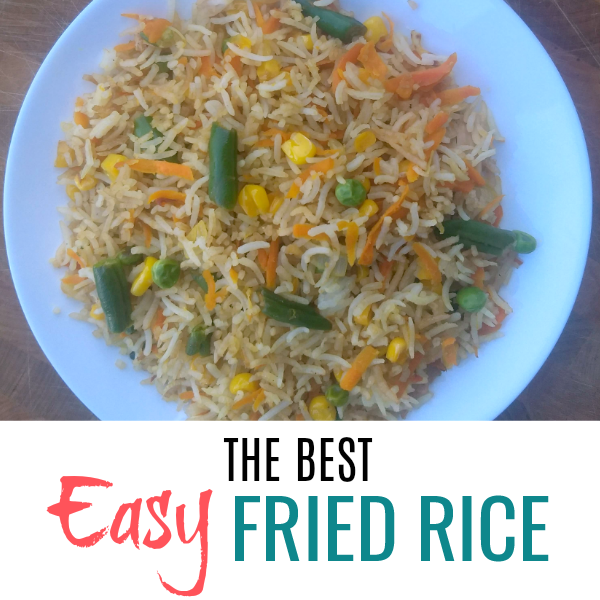 The kids love eating them and I love how simple they are to whip up. Win win. 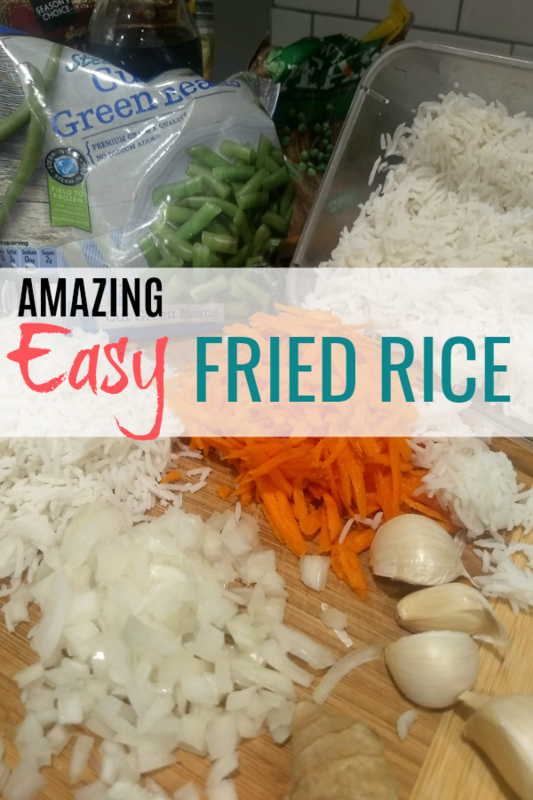 Before we dive into the recipe, I want to let you know what the 2 optional ingredients are. First off, vanilla. We know that vanilla makes pretty much everything better. Second, baking soda. This changes the color and how the cookie bakes just slightly. But again, you can leave it out. The one problem with three ingredient gluten free peanut butter cookies is that they tend to fall apart easily. I would make them on the small side to help remedy that problem (a child in tears because their cookie fell apart is never fun, right?). If you can resist diving in right away, I would let them cool all the way as well. I like to decrease the sugar to 3/4 cup, but that also slightly increases the breakability (like my made up word 😉 ) of them. One last thing, I love using my cookie scoop for these. I find it faster than a spoon because the dough is quite sticky. NOW, for this incredibly easy peanut butter cookie recipe. 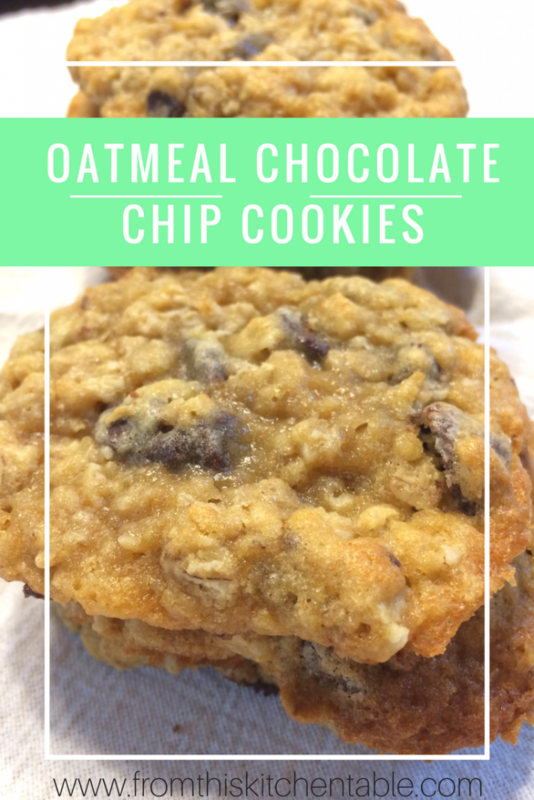 If you are looking for another yummy cookie recipe (that includes gluten and dairy) check out this one that came from my grandma. Place small scoops of dough in bowl with additional sugar and lightly coat the top. Place on cookie sheet and use a fork to gently press down in both directions to create the traditional peanut butter cookie crisscross. Bake for 6-7 minutes. Cool 2 minutes on baking sheet before removing to cooling rack. 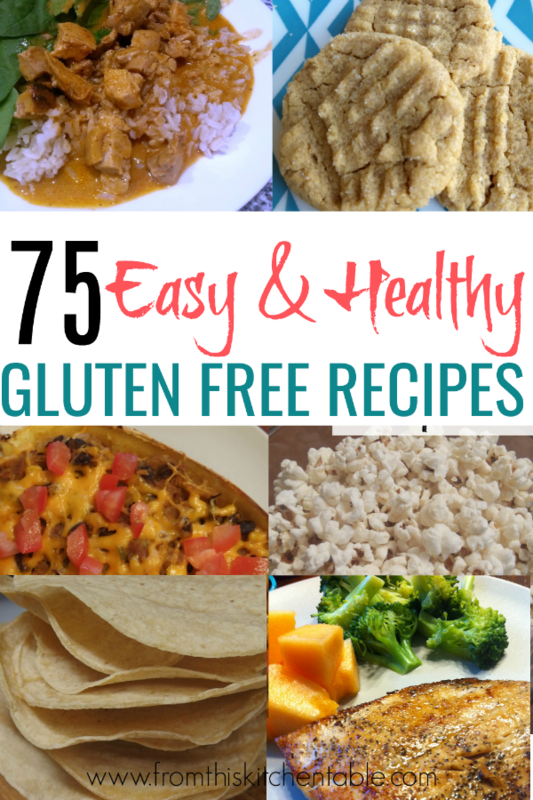 This entry was posted in Desserts, Recipes, Uncategorized on July 25, 2018 by Deanna Michaels. 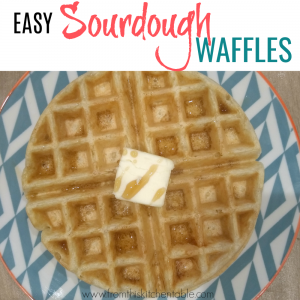 These easy sourdough waffles are on our menu weekly. Well, make that more than once a week. The kids eat them for breakfast at least twice and then we normally make them for Saturday lunch as well. 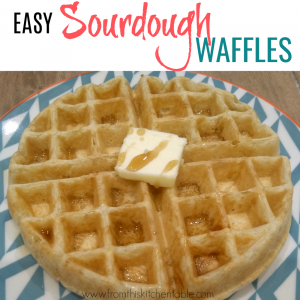 Not only are they easy, these are the best sourdough waffles! I recently delved into the vast world of sourdough. Wow, so much information and so much science. It’s fascinating. I don’t have the brain power (or energy) to be an expert sourdough maker but thanks to a starter my brother-in-law gave me I’m enjoying switching some of my regulars over to natural yeast. If you don’t have a brother-in-law quite as impressive as mine 😉 , (affiliate link coming) there are sourdough starters you can purchase on Amazon! You really can find everything there. 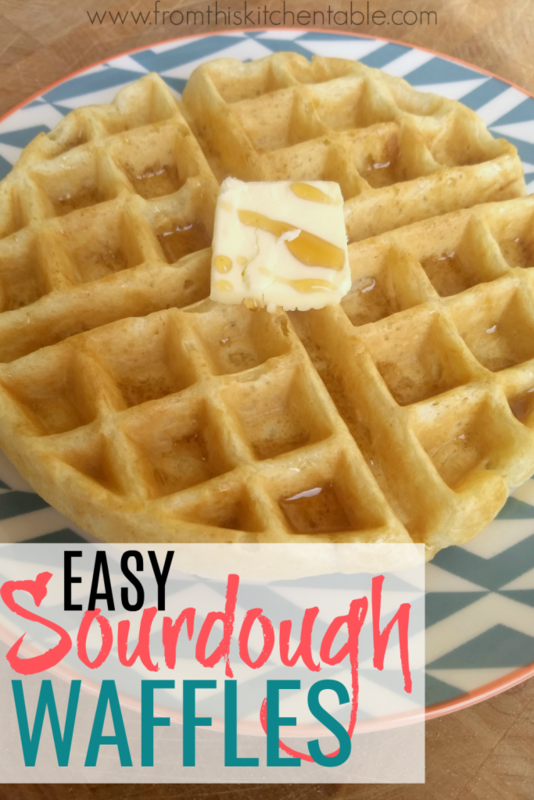 Besides these easy sourdough waffles, we also make sourdough sandwich bread and pizza dough weekly. 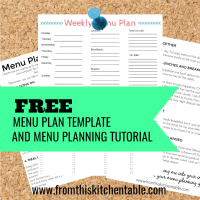 Because I’m not an expert, I’m not going to give you advice on starting or maintaining your starter, but I’m going to work on a post of my go to resources! I use recently fed sourdough in this recipe. I mix it up in the evening and the sourdough was fed that morning up to 3-4 hours prior. Combine sourdough starter, flour, and water in a glass mixing bowl. Depending on thickness of your starter you might have to adjust water. Cover and let sit overnight. The next day preheat waffle iron. Stir all remaining ingredients together (salt, baking soda, vanilla, melted butter, eggs, and sugar if desired) and pour on top of the sourdough mixture. Stir with a fork until combined. Cook in waffle maker until golden brown. Top with butter and maple syrup. I do not use sugar in my waffles. If making waffles for lunch I still start them the night before. 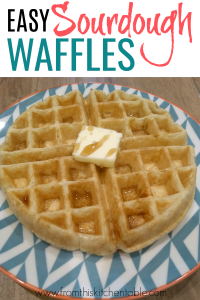 If I am making waffles for supper, I start the process in the morning. 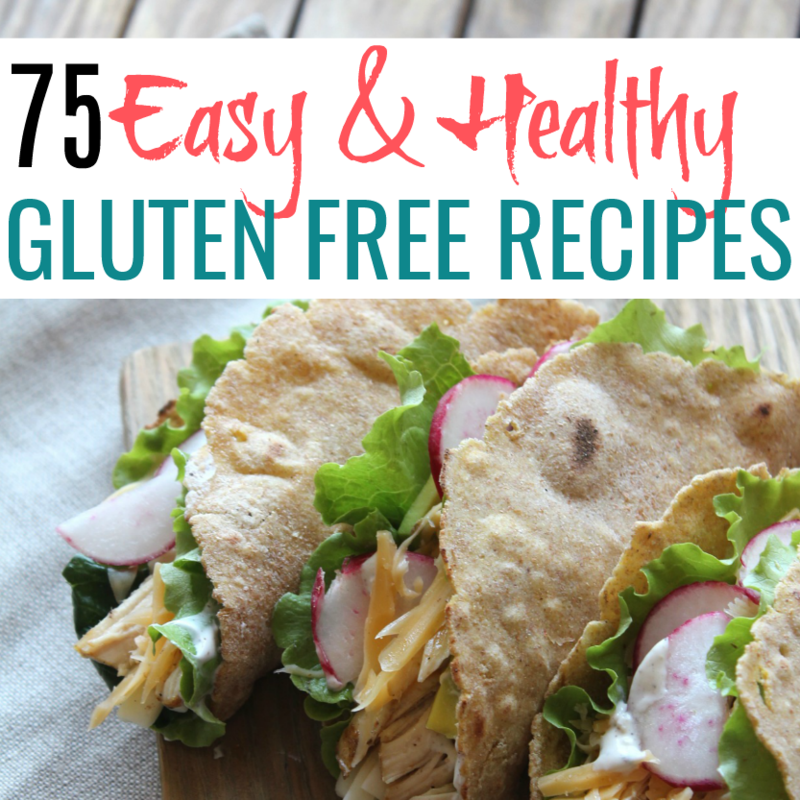 This entry was posted in Recipes on April 19, 2018 by Deanna Michaels. I have an amazing pizza recipe for you today. It’s a little bit different. In fact, you’ve probably never made or even eaten one quite like it. What exactly is it? 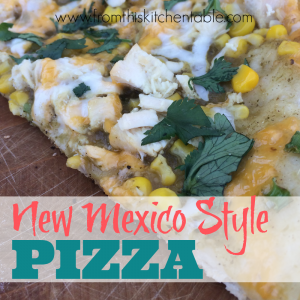 New Mexico Style Pizza! 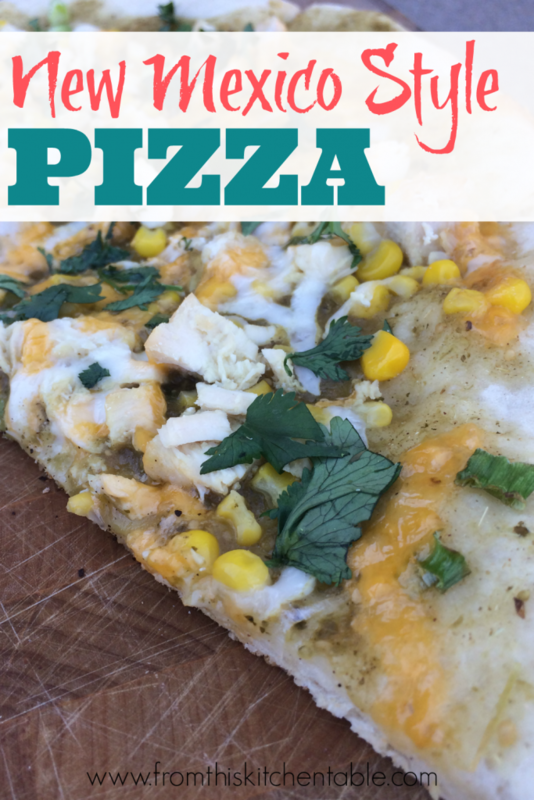 Think Mexican pizza with a twist. My mom found this recipe when I was growing up and I recently had to email her and ask for it, because I had to make it. 🙂 It’s been made several times in my house over the past few months. It was even a hit with company. See what I mean? It’s unique and full of flavor. I think this recipe would also be a great one to use up some of that leftover turkey on. Swap the chicken for turkey and your family won’t even think of Thanksgiving as they eat this. If you are looking for a pizza crust recipe, check out this one that I have. Pizza dough is super easy and forgiving. Plus, making it means you can get your preferred crust thickness. You could also buy refrigerated pizza dough (Trader Joe’s sells one) or a prebaked crust. 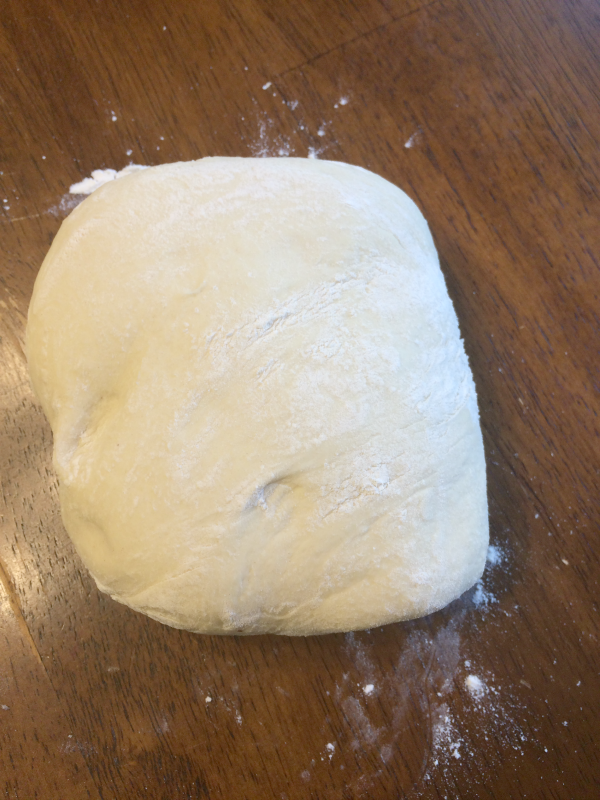 Roll out pizza dough (I do a 14 inch circle), place on pizza stone, and spread with the sauce mixture. 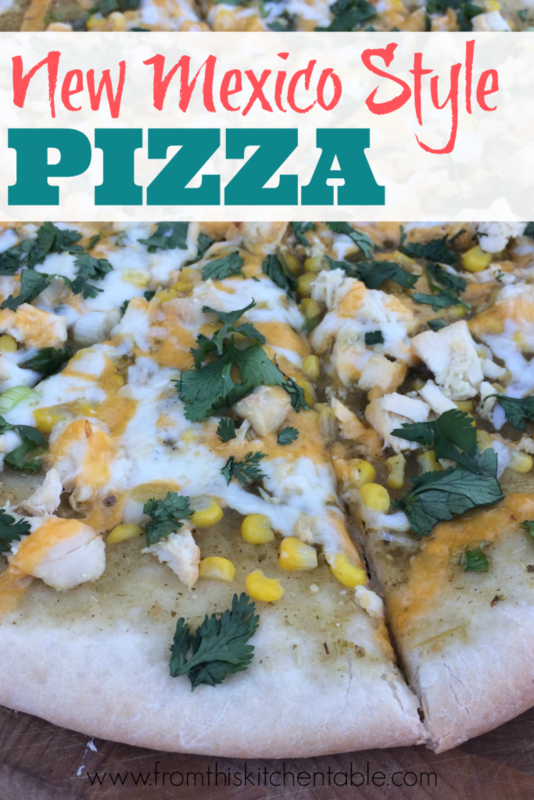 Top with chicken, corn, green onions, and cheese. Remove from oven and top with cilantro and sour cream (if desired). Cut into 8 pieces and serve. The original recipe called for a lot more sauce, so feel free to double the sauce ingredients if desired. We found that ½ cup of salsa verde was the perfect amount for one pizza. This entry was posted in Main Dish, Recipes on November 3, 2017 by Deanna Michaels. Oh my goodness. 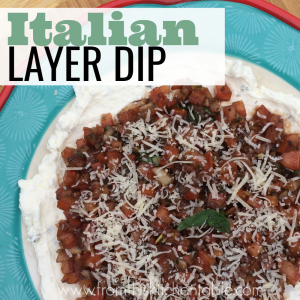 This Italian layer dip is amazing! 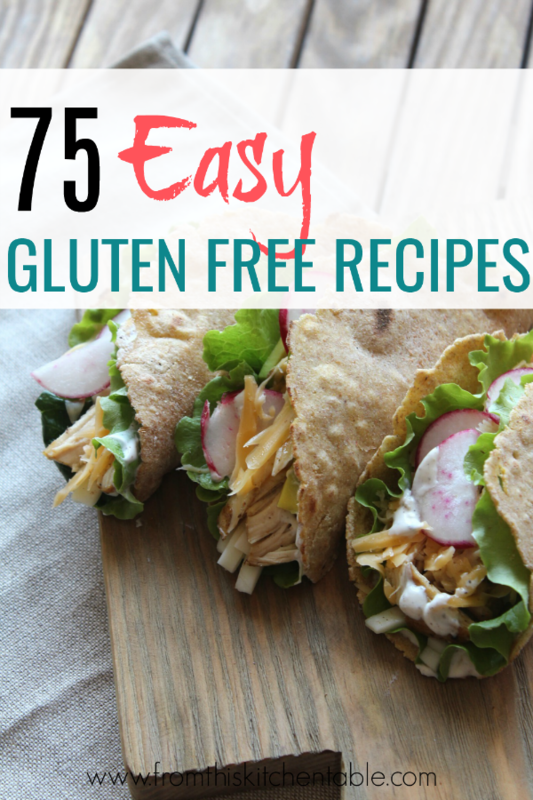 Definitely drool worthy and it’s also super easy and can be made in advance. It really can’t get much better than that. Basil, olive oil, and balsamic vinegar. All things I love and then when combined with creamy ricotta cheese it becomes over top. No pasta or heating of the oven makes this tasty Italian recipe perfect for all months of the year. This appetizer is refreshing, creamy, and light. Serve on top of bagel chips (or thinly sliced baguettes toasted in the oven is what I normally do) and you have the perfect combination. 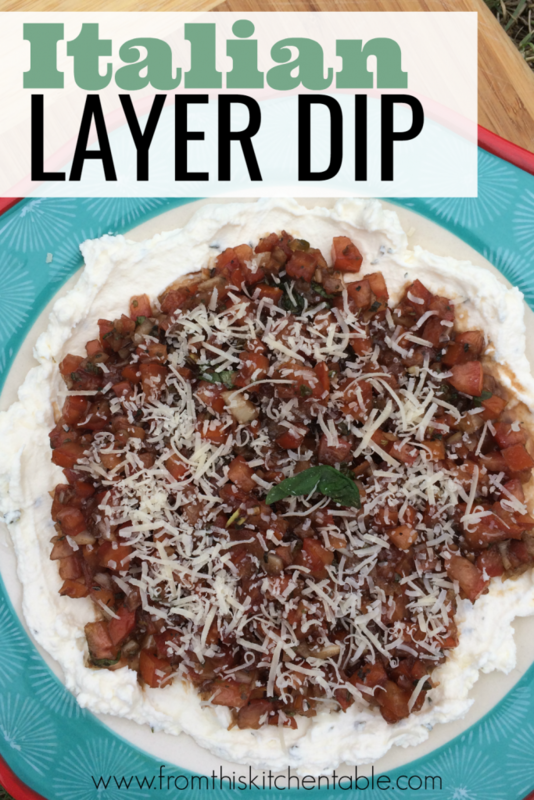 Ideal appetizer for a summer party, small group, cookout etc or you could serve it with a nice salad and you’d have an ideal meal for a girls’ night. To make ahead, combine the ingredients for the base and store in the fridge until ready to use. Do the same with the topping (storing in a different container). They can remain in the fridge for several days. Before serving, spread the base on your plate/platter and make sure to use the slotted spoon to scoop the tomatoes on the top. 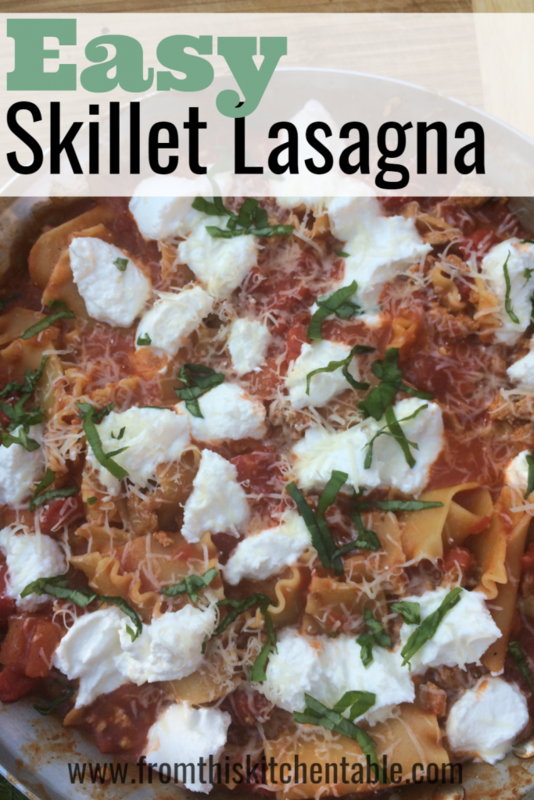 In case you are wondering what to do with the rest of the container of ricotta, don’t forget about Easy Skillet Lasagna (again, perfect for summer since you don’t have to turn the oven on)! Combine the cheeses until smooth. Stir in salt, parsley, and parmesan. Spread on the bottom of a plate or pie pan. 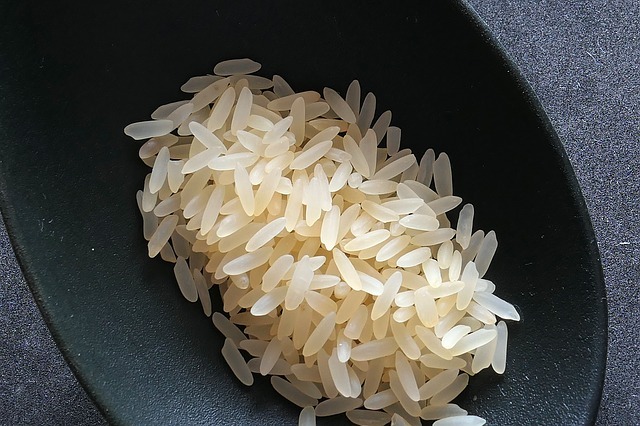 Combine all topping ingredients in a bowl. Adjust salt and pepper to taste. Using a slotted spoon to let as much of the liquid off as possible put on top of the cheese layer. Garnish with additional basil and freshly grated parmesan. Serve with bagel chips or thinly slices baguettes that you toast in the oven. This entry was posted in Appetizers, Uncategorized on June 6, 2017 by Deanna Michaels. 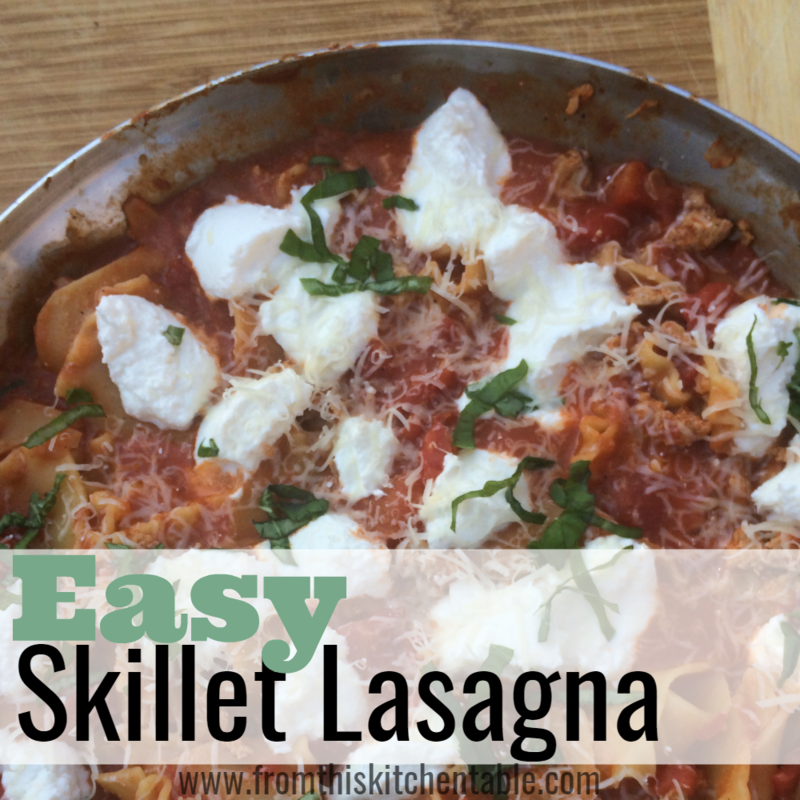 Easy skillet lasagna. Easy and lasagna probably aren’t two words you’d expect to see together – I know I don’t! 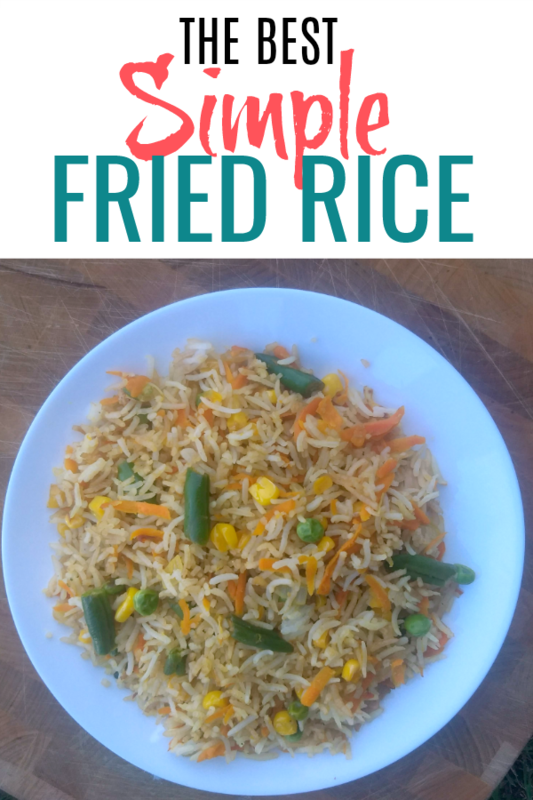 This recipe brings it one step further – it’s a one pot meal too! Doesn’t that make lasagna seem so much more accessible?! Say goodbye to the the multiples pots and bowls that pile up when you make the traditional version (and that’s not even counting the baking dish you have to scrub). I’m all about saving time in the kitchen and if you want to save even more time you could cook up double or triple portions of the meat/onion mixture you brown in the beginning and freeze in individual baggies. Prep time on the night you want this one pot lasagna for dinner would then be next to nothing. This is a great recipe to put the kids to work – let them break the noodles, dump the tomatoes, and plop the ricotta over the top. They’ll love helping put dinner on the table. My family prefers it when I buy petite diced tomatoes. Everyone of them protest big chunk of tomatoes. You could also use Italian style diced tomatoes for some easy extra flavor. 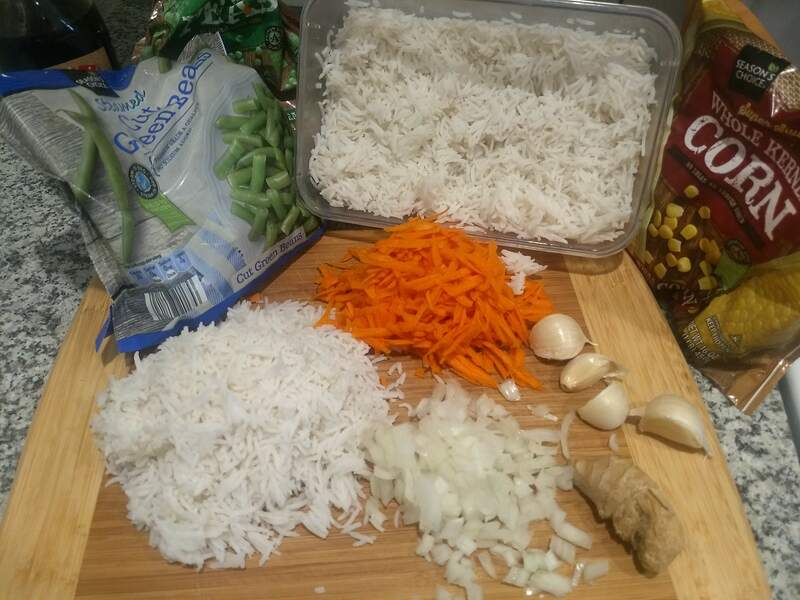 Seeing how few ingredients are in this dish, I recommend you use quality because all the flavors will come through. I hope you enjoy this tasty and simple dish that makes lasagna a weeknight meal as much as we do. All three kids (14 month old included) and my husband loved it when we made it again last week. Brown the meat, onion, garlic and red pepper flakes in a 12 inch skillet. Leave in the bottom of skillet and place the broken lasagna noodles on top. Pour the diced tomatoes with water and tomato sauce over noodles. Bring to a simmer, cover, and cook about 20 minutes until noodles are tender. Stir occasionally. Add more water if necessary. Remove from heat and stir in the Parmesan cheese and salt and pepper. Dot with tablespoons of ricotta cheese. Cover and let set for 5 minutes so the ricotta cheese warms. Sprinkle with fresh basil leaves and a little Parmesan. My family protests large chunks of tomatoes, so I use petite diced. You could also use Italian style diced tomatoes for additional flavor. 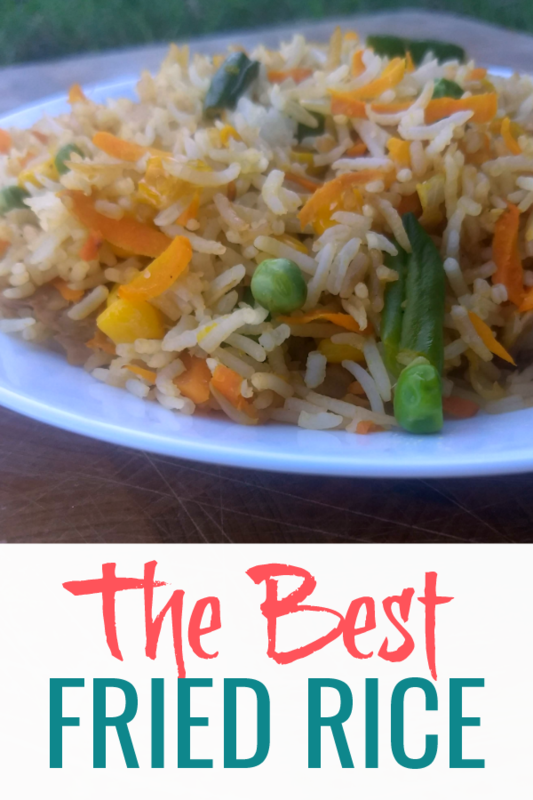 This entry was posted in Main Dish, Recipes on May 20, 2017 by Deanna Michaels. Homemade bread. The entire house smells amazing throughout the baking process and by the time it’s done you are more than ready to devour the loaf. Thankfully, bread is one of the most budget friendly things you can make and, in my opinion, you can’t have too many varieties in your repertoire. 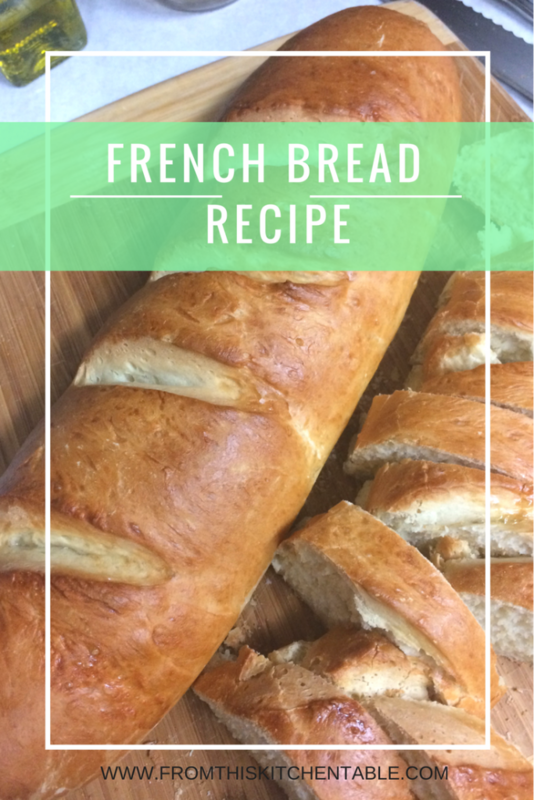 This homemade french bread is definitely one you need. 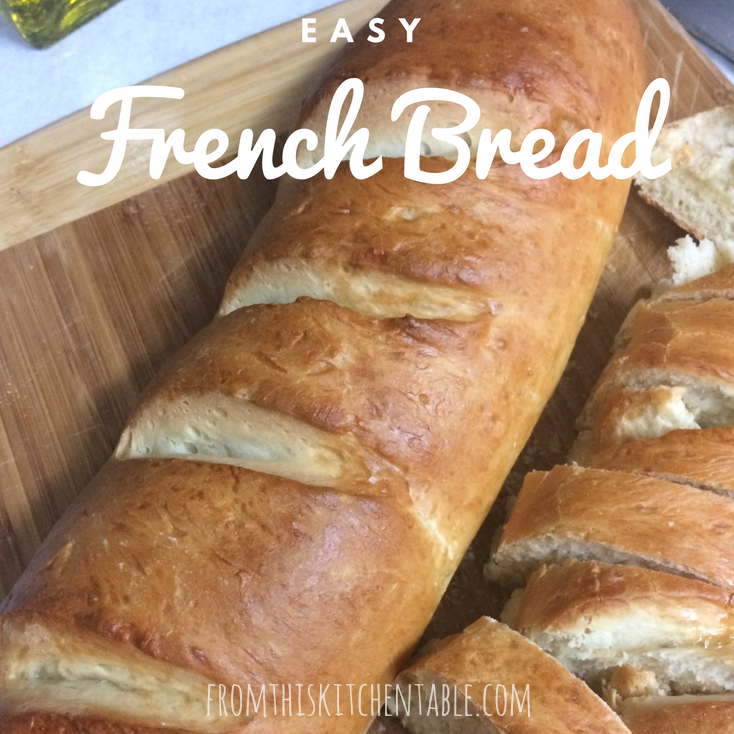 French bread might sound intimidating, but it’s really quite easy. You’ll need to be home for a few hours to get the process done, but the hands on time is actually minimal. Your family will be excited you made the effort and ask for this bread again and again. I pull out my trusty KitchenAid mixer for most all of my bread making jobs. The mixer even made my list of favorite kitchen appliances. Sure you could knead by hand but this saves me a lot of time (and man power). After making the dough, you’ll dump it onto a floured surface were you will knead it every 10 minutes for the next hour. 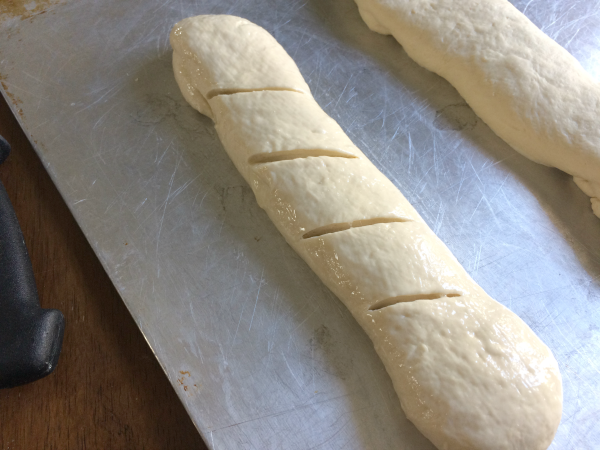 Next you’ll roll out the dough in a rectangle. Then roll the dough up on the long side (like you are making cinnamon rolls), tuck the ends under, and slash the top 4 times. This next step is optional – brush with some beaten egg white. The dough will rest a little longer and then you’ll get to enjoy the wonderful smell of your loaves baking! This batch makes 2 small loaves or 1 large loaf. Feel free to double the recipe by simply doubling the all the ingredients except for the yeast. For the yeast use 1 1/2 Tablespoons. For small loaves, I use my air bake cookies sheets. For a large loaf I have to use my half sheet pan. Put yeast, warm water, and sugar in the stand mixer bowl. Let sit 5 minutes. Add salt, oil, and 2 cups of flour and mix together. Add remaining cup of flour and knead 3-5 minutes. The dough will be soft, but if it's overly sticky add a tablespoon or two more flour. Dump the kneaded dough out onto a floured surface. Every 10 minutes for the next hour knead it a couple of times. After the hour, divide the dough into two for small loaves or for a large/regular sized loaf don't divide. 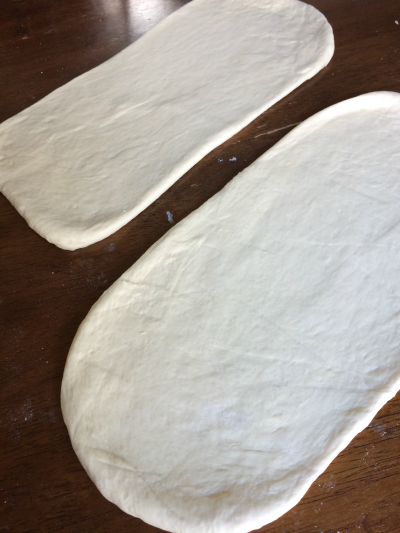 Roll dough into rectangles and roll up on the long side. Fold ends under. Place loaves on a baking sheet and slash the tops 4 times. Brush with beaten egg white (optional). Let raise for 30 minutes or until doubled in size. Bake for 10 minutes at 425 and turn down the temperature to 375 for another 10-15 minutes. (If making the larger loaf, might need to increase the second baking time to 15-20 minutes). This entry was posted in Bread and Muffins, Recipes on May 1, 2017 by Deanna Michaels.